To be perfectly honest, I haven’t ever given much thought to Belize, never mind chartering a boat there. However, after reading up on its history, and seeing how beautiful its coastline is, it’s a perfect destination for sailors and culturalists alike. The Belize Barrier Reef was declared a World Heritage Site by UNESCO in 1996. Credit to “A Brand New Life” crew for this great photo. First off, where is Belize? A question that even I had despite being from the Caribbean. Belize is located on the eastern coast of Central America. It is bordered by Mexico to the North and Guatemala to the South. 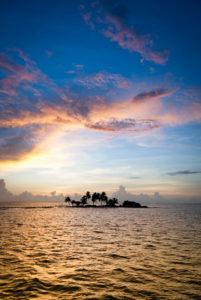 Mainland Belize is approximately 180 miles long and 68 miles wide. The Belize Barrier Reef is only trumped by Australia’s Great Barrier Reef in length and offers hundreds of cayes, inlets and estuaries. Perfect for exploring by catamaran. 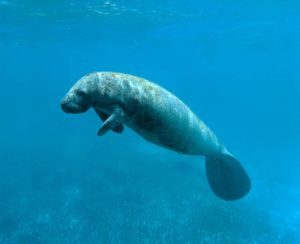 Manatees are one of the many sea creatures you might see while snorkeling. Why Charter a Boat in Belize? Christopher Patrick, CEO & owner of CKIM Group Inc., recently returned from a charter vacation with Belize Sailing Vacations (BSV). He said that the colors and clarity of the water off the coast were comparable to those experienced in French Polynesia. Besides paddleboarding, yoga and eating freshly caught fish, one of the other highlights was stopping at Reef’s End Lodge on Tobacco Caye and watching the divers on the reef at night time with their lights glowing under the water. “It was truly wonderful,’ he said. Belize Sailing Vacations offer all-inclusive trips tailored to your interests. Whether it be cruising along the barrier reef, paddleboarding in mangroves or visiting ancient Mayan temples, they offer a wide variety of experiences. 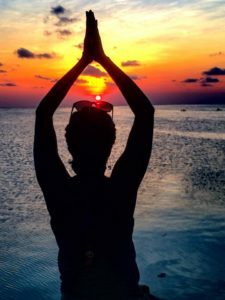 They also recently introduced a yoga & wellness retreat program, which offers yoga both onboard and onshore, as well as healthy meal plans and even all-natural beauty treatments. 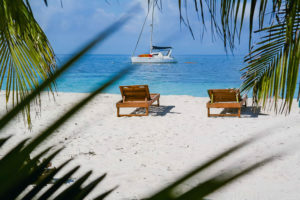 “We feel like it’s a good time to reintroduce the concept,” said Patricia Johnson, director of sales and guest services at Belize Sailing Vacations. Johnson is also head of trip design for BSV’s sister company, Absolute Belize, which handles more of the onshore scheduling. Johnson said that they introduced the wellness program previously, but it hadn’t picked up much traction. The increase in awareness of Belize as a travel destination made BSV think it was a good time to reintroduce the program. The Belize Tourism Board reported a 75 percent increase in overnight visitors arriving through international airports in 2018. The sheltered anchorages of Belize are perfect for paddleboarding. Credit to the crew of “A Brand New Life” for photo. Onboard the wellness charters, you will have a captain, 1st mate and certified yoga instructor at your service. “By default, these charters are very healthy,” said Rachael Wilson, owner of Absolute Belize and Belize Yacht Charters along with her husband, Cliff. Which makes sense, considering all the activities that are available, including spearfishing, paddleboarding, and snorkeling. Wilson went on to say, that guests could very easily spend five hours in the water without even realizing it. “All types of diets” are catered to, said Wilson, including vegan and paleo diets. One of the 1st mates, Sabrina, even offers handmade spa treatments like avocado face masks and scrubs. Families are also welcome. They have even had 7-month-old babies onboard in the past. The wellness program offers yoga and meditation. Last summer, Belize Sailing Vacations became a corporate sponsor for Oceana, the largest international advocacy organization focused solely on ocean conservation. BSV decided to extend that sponsorship, so if you book six nights between April 28th and December 15th, you get one night for $100. The $100 will then be donated to Oceana’s efforts to protect Belize’s barrier reef. The Belize Barrier Reef Reserve System was designated a World Heritage Site by UNESCO in 1996. It was later put on their “endangered” list and the country was told to improve their management and conservation of the reef. The reef is now off the list and Oceana seems is one of the major facilitators in promoting its health and conservation. In December 2018, Belize banned all offshore oil drilling. All single-use plastic bags, Styrofoam and plastic food utensils will be phased out by April of this year. And Belize Sailing Vacations is on the green wave. “We are trying to be a lot more sustainable as a company,” said Johnson. According to Johnson, the company limits its use of plastic bottles and offers reef-safe sunscreen. “We are a paperless organization as well,” she said. 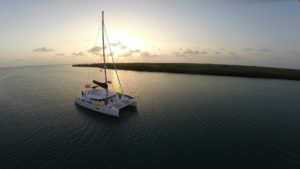 Belize Sailing Vacations normally picks up and drops off guests from Old Belize Marina in Belize City, but pickups are offered in other areas for a fee, including in Guatemala and Mexico. Goff’s Caye is a small island off Belize City.